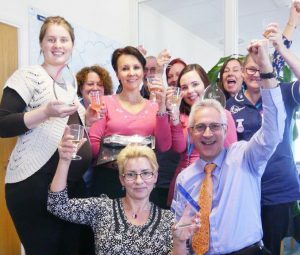 The Hipley Street team beat 200 other Bluebird Care offices across England, Wales, Scotland and Northern Ireland to win The Founders Award for outstanding contribution to Bluebird Care over the previous 12 months. They were also a finalist for the Franchise of the Year award, South West Region. Bluebird managing director Brian Colvin said: “The award is the result of outstanding commitment, creativity and hard work by the whole team – who have done an amazing job. We are all delighted to have won such a prestigious national award, especially as the competition was of such a high standard. To help address the problem of loneliness among older people, the organisation, which cares for people in their own homes, has started a dog visiting scheme as part of its “Every Visit Counts” Campaign. The Old Woking-based care provider encourages its team of 60 care assistants to bring some of their own dogs to visit canine-loving customers.